*Failure to pay student loans. *Riding with a passenger with an open alcohol container. *Riding on an airplane while intoxicated. What do these have in common? They are reasons the government has found to suspend the driving privileges of American citizens, and many people are unable to work as a result of these violations, or else feel forced to take their chances and hope they’re not caught. Charles Sanders received his letter from the Department of Homeland Security in February 2015, informing him that he lost his license because he owed $17,000 in unpaid child support. He went to speak with someone regarding this matter only to find that not only did he owe on two separate cases for the same child, but also that one of the individuals with a pending case against him had been deceased for over a year. The amount was a combination of two cases being opened for the same child. After further examination of both, it was soon discovered that the grandmother of the minor had been pretending to be the deceased daughter so that she could collect on her own case while also receiving the money that Sanders had been paying to the mother. Sanders is not the first to suffer from the surrender of his license. According to a report by the United States Government Accountability Office on February 18, 2010, federal and state governments have the ability to and often promote the suspension of driver’s licenses for non-driving offenses. This is done as a way to maintain child support programs, and to help obtain ten percent of the money necessary for federal highway funding. To date, Sanders’ license has been suspended four times. The amounts paid for each reinstatement totaled $4,234.00. An obvious consequence of the loss of a license is that the individuals involved have an even more difficult time paying what they owe. James Whitmore, 50, is another person who has fallen into the hole of a suspended license for unpaid child support. The amount he owes is for his son, who is now 28. The total needed to acquire his license is $480.00, plus a $75.00 reinstatement fee. “I never received a notice or anything about it. The only reason I found out … was because I was pulled over for a tail light being out, and it turned out that my tail light worked fine, but my license had been suspended since 2012,” said Whitmore. The situation with Felechia Chatman was very different. Chatman, 47, wasn’t aware that her license had been suspended for almost eight years because of a remaining balance on an unpaid traffic ticket. “I couldn’t believe they suspended my license for a funky $5.87,” she said. Chatman received a letter stating that she owed, but never received anything notifying her that she was no longer eligible to drive. None of these people had any idea of their lost driving privileges until they were pulled over by a police officer. And each person interviewed shared frustration with a catch-22 question: How were they expected to pay anything if they were unable to drive to a job where they could make the money to pay what was due? The City of Memphis does offer an alternative to people in that situation. According to the city’s website, as of July 1, 1999, any person with a suspended Tennessee driver’s license for outstanding traffic tickets can qualify for a Drive While You Pay Program, which allows the individual to get on a monthly payment plan while still continuing to drive. But some individuals don’t believe the program is practical enough. 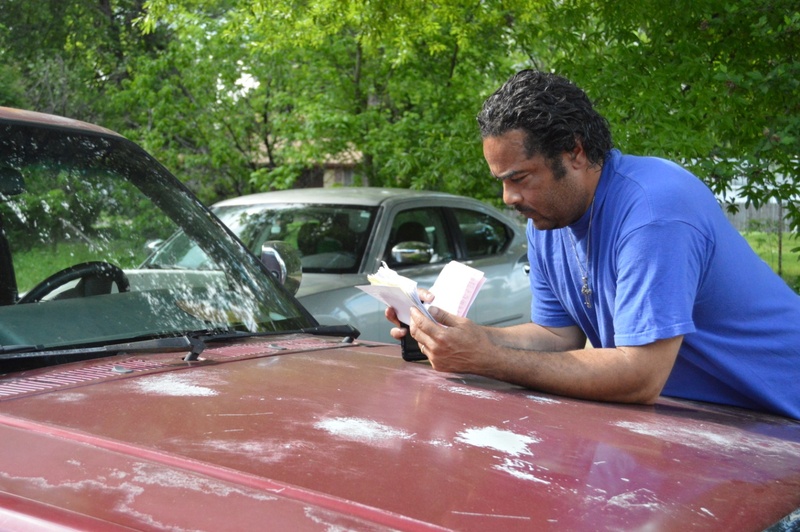 Taffic Edinbourgh leans against his truck as he looks over the paperwork he used to get his license reinstated. Taffic Edinbourgh, 44, was offered this option as a way to continue driving after his license was suspended for a DUI that he received in West Memphis, Arkansas, two years ago. Edinbourgh. The device would have cost him $100 per month to use, and he could only take it off after paying his fines. Edinbourgh continued to drive during the suspension because this was the only way he could obtain the money to get his license reinstated. The charges associated with his DUI conviction included $900 in fines, $600 in court costs, $350 in towing fees, $250 for bond, $250 for reinstatement of license in Memphis, $150 for reinstatement in Arkansas, $70 for a Mothers Against Drunk Driving course, $150 to change his DUI class from Memphis to Arkansas, $11 for an ID, and $23 for his actual license. Additional fees were also added, forcing him to spend over $7,500 to get his license. He also spent over 24 hours in court as a result of three visits lasting eight hours because the judge would not allow him to leave until he paid part of his fines. He did 24 hours of community service, one week in jail, and 12 hours in DUI classes. Taffic’s wife, Alechia, lost her license as a result of a wreck she was involved in over 18 years ago. It has been suspended four times as a result of a $4,000 judgment against her. “I was paying on it, and then I would stop paying on it. The lawyer the lady had keeps tracks of my payments, and when I don’t pay he has my license suspended,” said Alechia. She has spent $1,000 for license reinstatements compared to $1,500 she has paid on the case. They are not the same debt, and the $250 being used to ensure that Alechia continues to drive legally can’t be used toward her bill. Herman Wilkins, 44, knows the vicious cycle all too well. He stated that it was hard for him to try to pay to get his license reinstated when he was barely able to go to work without being pulled over and given additional tickets for driving on a suspended license. “I think I owe them about $1,000 for fines and tickets before I can get my license,” said Wilkins. He said that he was no longer trying to get it back because he just didn’t have the money. Tennessee is not the only state using this approach to collect unpaid court fees. A study done by John Pawasarat and Lois M. Quinn at the University of Wisconsin-Milwaukee showed that the state of Wisconsin promotes the suspension of driver’s licenses to obtain uncollected fines. This report concluded that the primary effect of this law was that a lot of underage drivers lost their privilege to drive before they ever received a license. Even more shocking in this report was the fact that failure to pay a ticket for a burnt out tail light caused a 24-month suspension, while speeding, reckless driving and a hit-and-run in which a person was injured all received a suspension of less than 12 months. In other words, dangerous driving was deemed less of a reason to suspend a license than was someone’s failure to pay.